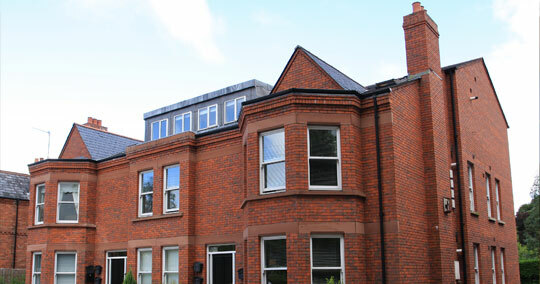 JDC Building Works were contracted for the complete development of 8 apartments at 96 Balmoral Avenue, Belfast including fitting out and all associated site works. The artichect for the project was Aidan McGrath of Twenty Two Over Seven, and the project was completed for £2.5 million. JDC Building Works act as building contractors throughout the public and private sectors, and are specialists in listed building refurbishment. JDC Building Works have a wealth of experience in the construction of private housing developments throughout the UK and Ireland. JDC Building Works are specialists in the construction of modular buildings and have created them across all industry sectors throughout the UK and Ireland. Established in 1982 and based in a 10,000 sq ft manufacturing complex on a 10-acre site, JDC Building Works has undergone continuous growth and development. From our initial general construction base we have expanded into private developements, specialist modular construction and quarrying. We act as main contractors on traditional build schemes: schools, hospitals, social housing, private housing developments, and civil engineering works. Our registration with Constructionline means we are approved public sector contractors for the whole UK.